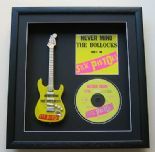 Suppliers of bespoke Framed Music Memorabilia and Presentation Awards. Celebrating UK Music Awards Worldwide. Music Dezigns have been working for over 20 years producing Gold, Silver and Platinum Disc Presentation Awards supplying the Music Industry, Trade and Fans with high quality framed memorabilia. With our unique music designs all of our products are made to the highest standard and are professionally manufactured using the best possible materials.